TLR2, together with TLR1 and TLR6, is essential for detecting lipopeptides and bacterial cell wall components such as lipoteichoic acid from Gram-positive bacteria. In this study, we report that transmembrane domain (TMD)–derived peptides from TLR2 and TLR6 specifically inhibit TLR2 activation. Secretion of the cytokines TNF-α and IL-6 by cultured macrophages (RAW264.7 cell line) was inhibited by these peptides in response to TLR2 activation by lipoteichoic acid (TLR2/6 activator) or palmitoyl (3)-Cys-Ser-Lys(4)-OH (TLR2/1 activator) but not by LPS (TLR4 activator). Extensive biophysical and biochemical assays, combined with GALLEX experiments, show that these peptides heterodimerize with their complementary TMDs on their reciprocal protein. These results suggest that TLR2/6/1 TMD assembly is essential for activating this complex. Importantly, when administered to mice inflicted by TLR2, but not TLR4-driven lethal inflammation, a selected peptide rescued 60% of these septic mice, showing potent in vivo inhibition of TNF-α and IL-6 secretion. Furthermore, this peptide also showed high protection in a whole bacteria model. Owing to the importance of TLR2 regulation under a variety of pathological conditions, compounds that can fine-tune this activity are of great importance. The innate immune response is a complex and highly regulated process. This system rapidly protects the host from a broad spectrum of invading pathogens and facilitates the activation and further development of the acquired immune response. An unregulated and systemic innate immune response can lead to sepsis, which is a growing health problem and a major cause of death in a hospital setting. In recent years, a large body of evidence has indicated that the family of TLRs plays a critical role in activating the innate immune system and the inflammatory response (reviewed in Refs. 1–3). TLRs are a family of conserved membrane receptors that recognize a wide variety of pathogen-associated molecular patterns (PAMPs) such as LPS from Gram-negative bacteria, lipoteichoic acid (LTA) from Gram-positive bacteria, flagellin, as well as many other compounds. Upon activation, these receptors initiate several signaling cascades, resulting in the activation of NF-κB and other survival pathways such as P38 and JNK (3). One of the main outcomes of TLR activation is the secretion of TNF-α, a major proinflammatory cytokine that plays many roles in the progression of the inflammatory process. In extreme cases, severe, unregulated activation of the inflammatory process leads to septic shock, organ failure, and death (1, 4, 5). Regulation and control of TLR signaling may be the key to prevent sepsis, because TLRs are essential for activating the innate immune system and are among the initiators of the cascades leading to the sepsis syndrome. For example, one of the main molecules inducing sepsis is secreted TNF-α, which is a hallmark of TLR activation (6). Activated TLRs exist in a dimeric state. Upon binding to their specific PAMP, they can either form homodimers, such as in the case of TLR4, or heterodimers as in the case of TLR2 with TLR1 and TLR6. Specific dimerization of TLR2 depends on the nature of its activator: diacylated lipoproteins are recognized by the extracellular part of the TLR2/6 complex, and triacylated peptides are recognized by the TLR2/1 complex (7, 8). The crystallization of the TLR2/1 extracellular complex, together with their synthetic ligand palmitoyl (3)-Cys-Ser-Lys(4)-OH (Pam3CSK4), has provided some insights into the mode of action underlying these receptors (9). According to the proposed model and based on other available data, a weak interaction exists between TLR1 and TLR2 prior to the binding of the lipopeptide (9). Upon binding of the activator, lateral movement of these receptors aligns them closer to each other, allowing multiple amino acids within the two molecules to stabilize this complex. The binding of the ligand induces conformational changes that induce the intracellular Toll/IL-1R domains of these proteins to move toward each other. This movement facilitates the recruitment of adaptor proteins and downstream signaling pathways, which ultimately results in TNF-α secretion (10). Crystallization of the TLR2/6 complex with various ligands suggested that a similar mechanism exists for this heterodimer as well (11). Despite extensive studies on both the extracellular and cytoplasmic domains of the different TLRs, still little is known about the role of the transmembrane regions of these proteins and how they affect assembly and function. However, there is extensive evidence indicating that the transmembrane domains (TMDs) of membrane proteins in general play an important role in their activation and regulation (12–14). Recent studies in model systems have shown preliminary evidence that TLR TMDs have the capacity to form heterotopic interactions (15). In addition, the TMDs of several TLRs and their flanking hydrophobic regions were shown to be involved in their trafficking and activation (16–18) underscoring the importance of this region. Short synthetic peptides that are derived from various proteins and are capable of interfering with protein function have been used extensively to probe the mode of action of the parental proteins. Such peptides have been derived from both extracellular and membrane-embedded domains. In this study, the effect of TMDs derived from TLR2 and TLR6 on TLR2 activation as well as the biological consequences of such an effect were examined. Exogenously added peptides that correspond to the TMDs of this complex were able to specifically inhibit the activation of these proteins in cell-cultured macrophages. A multidisciplinary approach was used to show that these peptides can interact with each other, favoring heterodimers rather than homodimers, suggesting a preliminary mechanism for the role of these TMDs in TLR2 activation. Furthermore, coimmunoprecipitation (co-IP) assays with specific TLRs and TLR TMD peptides were performed, highlighting the ability of these peptides to interact with their complementary TLR proteins. Finally, the biological significance of this interaction was further studied in vivo. Using a mouse acute inflammation model caused by LTA as well as a lethal inflammation model caused by heat-killed Gram-positive bacteria, we were able to show that a TMD peptide derived from TLR2 dramatically reduced the progression of these pathological conditions and also had a prophylactic effect. This peptide did not exhibit a protective effect after LPS challenge, suggesting specificity toward TLR2 activation. The fact that this peptide inhibits the inflammatory response at the initial stages and has a prophylaxis value suggests that it might be a valuable treatment and could lower the overall occurrence of sepsis. Peptides were synthesized by a 9-fluorenylmethoxylcarbonyl solid-phase method on Rink amide methylbenzhydrilamine resin (Calbiochem-Novabiochem, San Diego, CA) by using an ABI 433A automatic peptide synthesizer (Applied Biosystems, Foster City, CA). Peptide synthesis was followed by peptide cleavage from the resin by incubation for 3 h with 95% trifluoroacetic acid, 2.5% H2O, and 2.5% triethylsilane. The crude peptide was purified by RP-HPLC (>98%) on a Vydac C4 column (Grace Discovery Sciences, Deerfield, IL). The peptides were identified by electrospray mass spectroscopy. All in vitro assays were performed on RAW264.7 murine macrophages (ATCC TIB71). Cells were grown in DMEM supplemented with 10% FBS, l-glutamine, sodium pyruvate, nonessential amino acids, and antibiotics (Biological Industries, Beit-Haemek, Israel). The incubator was set at 37°C with a humidified atmosphere containing 5% CO2. A total of 1 × 104 cells/well were grown overnight on a 96-well plate. The following day, the media were replaced with 90 μl fresh culture medium and a 10-μl solution buffer with different amounts of the assayed peptides. Peptide concentrations ranged from 0.78 to 100 μM. The cells were then incubated for 2 h before adding to each well 50 μl 2,3-bis-2H-tetrazolium-5-carboxanilide inner salt reaction solution (Biological Industries). Viability was determined as described previously (19, 20). The LC50 (the concentration at which 50% of the cells die) for each peptide was obtained from the dose-dependent cell viability curves. A total of 2 × 105 cells/well were cultured overnight in a 96-well plate. At the following day, media were replaced by fresh DMEM, including all supplements. TLR TMD peptides were dissolved in DMSO and added to the cells in different concentrations. The final concentration of DMSO was 1% for all groups. Cells were incubated with the peptide for 2 h and then washed twice and incubated with fresh media containing either LTA, Pam3CSK4 (TLR2 activators), or LPS (TLR4 activator). LTA concentrations varied between the different experiments. For TNF-α experiments, cells were incubated with the indicated activators for 5 h at 37°C, after which samples of the media from each treatment were collected and stored at −20°C. TNF-α levels in each sample were evaluated using a mouse TNF-α ELISA kit (Biosource ELISA; Invitrogen), according to the manufacturer’s protocol. All experiments were done in triplicates. For IL-6 experiments, cells were incubated with the different peptides as described for TNF-α assays. Following incubation and washes, cells were further incubated with 2 μg/ml LTA or 400 ng/ml Pam3CSK4 for 12 h, and the supernatant was collected. IL-6 ELISA (Ready-Set-Go ELISA, eBioscience, San Diego, CA) was performed, according to the manufacturer’s protocol. All experiments were done in triplicates. The following fluorophores were used for fluorescent labeling: 4-fluoro-7-nitrobenzofurazan (NBD-F; BioChemika), CFSE (BioChemika), and TAMRA (BioChemika). Resin-bound peptides were treated with each of the listed activated fluorophores, dissolved in dimethyl formamide, leading to the formation of resin-bound N-terminal fluorophore peptides. Two-percent N,N-diisopropylethylamine was added to the TAMRA and fluorescein solutions. Incubation was done for 1 h (NBD) or overnight (TAMRA and fluorescein). Following the incubation, the resin was washed thoroughly with dimethyl formamide and then with methylene chloride, dried under nitrogen flow, and then cleaved and purified as described above. Large unilamellar vesicles (LUVs) composed of phosphatidylcholine (PC) and cholesterol (Chol) (9:1, w/w) were prepared using the extrusion method as described previously (21). The fluorescence experiments were performed with pairs of peptides using fluorescein-labeled peptides as donors and rhodamine-labeled peptides as acceptors. Fluorescence spectra were obtained at room temperature, with excitation set at 494 nm (10 nm slit) and emission scan at 500–600 nm (10 nm slit) by a Cary Eclipse Fluorescence Spectrophotometer (Varian, Palo Alto, CA). In a typical experiment, a fluorescein-labeled peptide was added first from a stock solution in DMSO (final concentration of 0.1 μM peptide in 0.25% (v/v) DMSO in water) to a solution containing PC:Chol LUVs (9:1) (100 μM) in HEPES buffer. This was followed by the successive addition of rhodamine-labeled peptides to a final concentration ranging from 0.025 to 0.4 μM. Fluorescence spectra were obtained before and after the addition of the rhodamine-labeled peptides. Fluorescence values were corrected by subtracting the changes in emission obtained by adding HEPES only. Maximum fluorescence resonance energy transfer (FRET) values were obtained by calculating the changes in the emission of the donor peptide at 521 nm. FRET affinity was calculated using nonlinear least-squares (NLLSQ) fitting as described below, from which the values of ∆F(max) (maximal change in fluorescence in the system) were extrapolated. The percentage of each donor:acceptor ratio was calculated as: ΔF = ΔF(sp)/ΔF(max) × 100, where ∆F(sp) is the ∆F for the specific ratio. The FRET affinity value (KFaff) was determined as 1/KF, where KF is the acceptor:donor ratio in which 50% of ∆F is reached. Therefore, the higher the value of KFaff, the stronger is the affinity between the two peptides examined. Circular dichroism (CD) measurements were performed by using an Applied Photophysics spectropolarimeter. The spectra were scanned using a thermostatic quartz cuvette with a path length of 1 mm. Wavelength scans were performed at 25°C; the average recording time was 15 s, in 1-nm steps, through the wavelength range of 195–260 nm. Peptides were scanned at a concentration of 50 μM in buffer only (PBS) or in a membrane mimetic environment of 1% lysophophatidilcholine (LPC) in PBS solution. Calculation of the α-helical content of the peptides was performed using the CDNN software and estimated from the CD signal at 222 nm with θ222 = −33,000 deg cm2 dmol−1 correlating with 100% helicity (22). PC:Chol LUVs were successively added to a 0.1 μM NBD-labeled peptide dissolved in double distilled water. The changes in NBD emission (530 nm; ΔF) were monitored as a function of the lipid/peptide molar ratio with excitation set at 467 nm (10-nm slit) until the system reached equilibrium. To account for the background, the emission of LUVs alone at the same wavelength was subtracted. The changes in the probe emission represents the amount of peptide bound to the hydrophobic interface, because NBD is known to change its emission wavelength in a hydrophobic environment (23), thereby enabling us to evaluate the peptide binding to LUVs. The system reached binding equilibrium (Fmax) at a certain lipid/peptide ratio, and therefore, the KD could be calculated from the relationship between the equilibrium level of NBD-labeled peptide emission and the lipid concentration, using a steady-state affinity model. The affinity constants were thus determined by NLLSQ analysis. The NLLSQ fitting was done using the following equation: Y(x) = Ka × X × Fmax/(1 + Ka × X), where X is the lipid concentration, Fmax is the maximal difference in the emission of NBD-labeled peptide before and after the addition of the lipids (it represents the maximum lipid peptide bound or the equilibrium-binding response), and Ka is the KD in M−1. The hetero-interactions of the TMDs within a natural membrane environment were studied using the GALLEX assay (24, 25). The expression vectors and Escherichia coli strains required for the assay were provided by Dr. D. Schneider (University of Gutenberg, Mainz, Germany). Briefly, GALLEX uses a chimeric protein in which the DNA sequence for an α-helical TMD of interest is inserted between the N-terminal domain (residues 1–87) of the LexA protein and the gene for the maltose-binding protein (MBP, encoded by the MalE gene) from E. coli. Two plasmids are used in the assay containing either the wild-type LexA sequence (pBLM, encoding for resistance to tetracycline) or a mutated form of LexA (pALM, encoding for resistance to ampicillin). The desired TM sequences are inserted between these two protein sequences using standard cloning techniques. The resulting plasmids were both transformed into an SU202 E. coli strain, which then expressed the LexA-TM-MalE fusion proteins (after induction with 1 mM isopropyl β-d-thiogalactoside [IPTG]). Heteroassociation of TMDs leads to the formation of LexAWT/LexAmut heterodimers that bind to a hybrid LexA promoter/operator in the reporter strain SU202 (that recognizes the mutant LexA domain) and repress the expression of β-galactosidase (β-gal). Furthermore, as the hybrid promoter is designed to bind only the wild-type and mutant heterodimers, it will not recognize wild-type LexA homodimers. Thus, TM homo-oligomer formation does not interfere with the measurement of hetero-association. Sequences of the TLR TMDs used are shown in Fig. 1 (without the two Lys at both termini), and those of glycophorin A (GpA) and its G83I mutant, used as positive and negative controls, respectively, are ITLIIFGVMAGVIGTILLI and ITLIIFGVMAIVIGTILLI. All the constructs were confirmed by DNA sequencing. The dimerization propensity of the two constructs was measured by transforming an E. coli SU202 indicator strain with the relevant pALM and pBLM plasmids (each harboring a different TM sequence) simultaneously (26). The bacteria were grown overnight in the presence of 1 mM IPTG in LB medium with ampicillin and tetracycline in a 24-well plate. A total of 10 μl bacteria were resuspended in 100 μl Z-buffer (60 mM Na2HPO4, 40 mM NaH2PO4, 10 mM KCl, 1 mM MgSO4 [pH 7], 10% chloroform, and 1% 2-ME), and the absorbance (OD600) was measured. Bacteria were lysed with 50 μl 2% SDS in Z-buffer. o-Nitrophenyl-galactopyranose was added, and a kinetic reading of absorbance at OD405 was performed for 20 min to measure the activity of β-gal. Vmax was calculated and divided by the absorbance at OD600 to correct for bacterial growth. Strong dimerization results in strong inhibition of β-gal expression and less color formation. Two plasmids are used in the assay containing either the wild-type LexA sequence (pBLM) or a mutated form of LexA (pALM), carrying genes for resistance to tetracycline and ampicillin, respectively. The assay was done with the presence of both antibiotics to ensure retention of both plasmids. Western blot analysis was performed to normalize the expression level of β-gal to the expression levels of the chimera proteins. Aliquots of 10 μl SU202 cells, each with a different plasmid, were mixed with a sample buffer, frozen for 1 h at −80°C, boiled for 5 min, subjected to 12% SDS-PAGE, and then transferred to nitrocellulose. The primary Ab used was anti-MBP (New England Biolabs, Ipswich, MA). The secondary Ab was goat anti-mouse HRP. The detection was done with the Phototope-HRP Western blot Detection System from Cell Signaling Technology. Membrane insertion and correct orientation were examined as described previously (24). Briefly, PD28 cells transformed with the different plasmids were cultured overnight. Only if the MBP portion of the chimeric protein is present in the periplasm will the cells be able to use maltose as the carbohydrate source, because this strain is deficient in endogenous MBP. The cells were washed twice with PBS and then plated on M9 minimal medium agar plates including 0.4% maltose, 1 mM IPTG and the appropriate antibiotic to maintain the plasmid. Bacterial growth was visually observed after overnight incubation. RAW264.7 cells (2.5 × 106) were incubated with 5 or 10 μM rhodamine-labeled peptides, for 2 h at 37°C. The cells with a specific peptide were washed and lysed with ice-cold radioimmunoprecipitation assay buffer (20 mM Tris [pH 7.4], 137 mM NaCl, 10% glycerol, 1% Triton X-100, 0.5% sodium deoxycholate, 0.1% SDS, and 1:100 dilution protease inhibitor mixture). After 15 min of centrifugation at 14,000 rpm, 4°C, the soluble fraction was separated and incubated overnight with different TLR Abs including anti-TLR1 and anti-TLR6 (Santa Cruz Biotechnology), anti TLR2 (eBioscience), anti-TLR4 (BioLegend). Protein G beads (Santa Cruz Biotechnology) were added for a second overnight incubation. The beads were washed with cold PBS five times, diluted 1:2 with SDS tricine buffer (Novex; Invitrogen), and boiled for 10 min at 95°C. Samples were run on 10% SDS-PAGE. The presence of the labeled peptide was detected with a Typhoon fluorescent scanner (GE Healthcare, Waukesha, WI). Excitation was set at 532 nm and emission at 585 nm. Western blot analysis was performed under standard conditions with a secondary Ab of anti–rat-conjugated HRP (Jackson ImmunoResearch Laboratories). To verify equal loading amounts anti-tubulin was blotted using an anti-tubulin Ab (Santa Cruz Biotechnology). Rhodamine-labeled peptides were dissolved in DMSO, added to 400 μl HEPES with 0.1 mM PC:Chol (9:1) LUVs, and brought to equilibrium (the peptide’s final concentration was 0.1 μM, 0.25% v/v DMSO). Changes in the intensity of the fluorescence emission were followed before and after the addition of proteinase K (Sigma-Aldrich) using a SLM-Aminco luminescence spectrometer (SLM-Aminco, Rochester, NY). The excitation wavelength was set at 530 nm and emission at 580 nm, and the final concentration of proteinase K was 62.5 μg/ml. An increase in fluorescence indicates that the peptide exists as an oligomer (27). All fluorescence measurements were performed at 25°C. Animal studies were carried out in strict accordance with the Israeli law and the National Research Council guidelines. All animal experiments were conducted at the Weizmann Institute of Science and approved by the Weizmann Institutional Animal Care and Use Committee (Institutional Animal Care and Use Committee permit number 01190107-4). To examine the effect of TLR TMD peptides on acute sepsis-like effects driven by TLR2 hyperactivation, a murine model was used as described before (5). Briefly, 12-wk-old C57 Black female mice were injected i.p. with 100 μg LTA in a saline solution (pH 6.5) containing 200 μg/ml D-galactosamine (D-gal) (Calbiochem). The treated mice received two injections of a peptide at doses of 5 mg/kg. The first injection was given at the time of LTA injection, and the second injection was given 12 h (5 mg/kg) later. In the protection protocol, mice were injected once with 10 mg/kg peptide, 1 h before the LTA challenge. Animals were monitored for survival for the next 14 d after LTA injection. Peptides used for in vivo experiments were treated twice with 20% acetic acid to replace the trifluoroacetate anion added during HPLC purification. For the TLR4-driven sepsis-like model, the mice received a single injection of 2 μg purified LPS from E. coli and TLR2 TMD C′ peptide under the same conditions described above. All mice died within the first 24 h from the LPS challenge. For all groups, n = 8. To study the ability of the TLR-derived peptide to inhibit sepsis-like effects driven by Gram-positive bacteria, we used a mouse model of heat killed Staphylococcus aureus. Bacteria were grown from single colonies overnight in LB media at 37°C, and the following day the stock was diluted 1:1000 in fresh LB. Bacteria were grown to 1 OD (λ = 600 nm). The media were centrifuged at 4°C for 15 min at 8000 × g using a sorvall centrifuge. The pellet was resuspended in saline to result in a concentration of 5 × 1011 bacteria/ml. To minimize additional pathogenic effects of the bacteria, prior to their introduction to the animals, bacteria were heat killed at 90°C for 30 min. Samples of the heat-killed bacteria were plated on agar plates to ensure complete killing. Mice were injected with 200 μl of the bacterial solution i.p. and immediately injected with 5 mg/kg of either TLR2C′ TMD peptide (2C), TLR2 scrambled peptide (scr), or saline only (untreated). Survival was monitored for the following 48 h, and serum was obtained after 90 min by ocular bleeding. To ensure that mice did not die because of any internal injuries, after their death or at the end of the protocol, mice abdomen was revealed, and internal organ integrity was verified (data not shown). To examine the effect of TLR TMD peptides on cytokine secretion within this model, mice received an i.p. injection of LTA, followed by TLR2C′ TMD peptide (5 mg/kg) or saline only. An additional group of mice (n = 4) received only a saline injection serving as a baseline control for the cytokine level. After 90 min, 120 μl blood was collected from each mouse, left at room temperature for 30 min to coagulate, and then kept at 4°C overnight. Samples were then centrifuged at 3000 rpm for 15 min, and the supernatant (serum) was transferred to a new tube. TNF-α and IL-6 ELISAs were performed using the Platinum ELISA kit (eBioscience), according to the manufacturer’s instructions. Serum samples were diluted 1:5. For the whole-bacteria sepsis-like model, the procedure was identical, but 150–200 μl blood was collected, and samples were diluted 1:2. Mice were treated as described above in the cytokine detection in vivo experiments. After 24 h, mice were sacrificed, and livers were removed and kept in formaldehyde (4%) for 18 h and embedded in paraffin blocks. Four-micrometer sections were then prepared and stained with H&E by standard protocols. Photos were captured using Nikon microscope equipped with 3CCD camera. The putative TMDs of TLR2 and TLR6 were first identified. Fig. 1 shows the predicted TMDs of these proteins aligned to each other. These predicted TMDs are 21 aa long and contain a short hydrophobic region adjacent to their TMDs from the intracellular side. The amino acid sequence of TLR1 and TLR6 TMD is identical (Fig. 1A). Peptides derived from either TLR2 or TLR6 TMDs were synthesized and tested for their ability to affect macrophage activation by LTA, a TLR2/6 activator. This could take place by interfering with the interaction of the endogenous region with other TMDs. Initially, two overlapping peptides for each TMD were synthesized, containing ∼20 aa each: the N terminus TMD and an extended C terminus, of both TLR2 and TLR6 (Fig. 1B). The C′-TMD region was extended because it corresponds to a similar region in TLR4, which was shown by mutational analysis to participate in regulating the oligomerization of this protein (18). Lysines were added to the termini of these peptides to improve solubility, and cysteine residues, which are average in bulk and relatively hydrophobic, were replaced by alanine for synthetic ease. Such replacements usually do not affect the activity of a membrane protein, particularly interaction abilities, as shown in various models (28–30). Multiple sequence alignment of TLR TM regions derived from Mus musculus. (A) Predicted TMDs were obtained from the UniProt/SwissProt database, and sequence alignment was performed by ClustalW. Identical amino acids are indicated by *, and similar amino acids are indicated by a colon (:). The underlined regions are the transmembrane domains as predicted by UniProt and from which the peptides in the study are derived. (B) Peptide designations and sequences. Bold letters within sequence indicate original cysteines mutated to alanines, and lysines were added at both termini for all peptides. †Toxicity is represented by the LD50s for each peptide. No significant toxicity was observed at 25 μM. The data revealed that the TMDs of TLR2 and TLR6 inhibit TNF-α secretion after LTA activation (Fig. 2). The inhibition was dose dependent when performed under low TLR2 activation (100 ng/ml LTA; Fig. 2A) and did not affect the activation of the closely related protein TLR4 (10 ng/ml LPS; Fig. 2B). A total of 20 μM of the different peptides inhibited high TLR2 activation as well (500 ng/ml LTA) but did not affect LPS activation (Fig. 2C, 2E, respectively). Low and high LTA activation resulted in 124.8 ± 7.4 and 498.5 ± 72.9 pg/ml TNF-α, respectively. LPS activation resulted in 2.6 ± 0.2 ng/ml TNF-α. These findings suggest that the effect of the TLR2 and TLR6 TMD peptides is specific for TLR2 but not for TLR4. The effect of TLR TMD peptides on TNF-α and IL-6 secretion by PAMP-activated RAW264.7 cells is PAMP dependent. (A and B) Cells were incubated for 2 h with increasing concentrations (1 μM [black bar], 5 μM [gray bar], and 10 μM [light gray bar]) of the different TMD peptides and then washed and activated with low amounts of LTA (100 ng/ml, A) or LPS [10 ng/ml (B)]. (C–E) Cells were incubated with 20 μM of the indicated peptides for 2 h and then washed and activated with high LTA concentrations [500 ng/ml (C)], Pam3CSK4 [100 ng/ml (D)], or LPS [10 ng/ml (E)]. Levels of TNF-α in the supernatant were assessed by ELISA after 5 h of stimulation. (F and G) Cells were incubated with 20 μM of the indicated peptides for 2 h and then washed and activated with LTA (2 μg/ml) or Pam3CSK4 (400 ng/ml) for 12 h. The levels of IL-6 in the supernatant were determined by ELISA. Statistical analysis was performed using one-way ANOVA analysis [for (A) and (B) n = 3, SD calculated for all experiments; for (C)–(G) n = 4 SD calculated for all experiments]. *p < 0.01, **p < 0.001 as calculated by one-way ANOVA. To verify the specificity of these peptides to the TLR2 complex, we tested their ability to affect TLR2/1 activation (Fig. 2D). This complex was activated by the synthetic ligand Pam3CSK4 and was inhibited 20–30% by the different peptides (p < 0.05, one-way ANOVA; for TLR2 TMD C′, p < 0.001). TNF-α levels after Pam3CSK4 activation were 774.6 ± 4.9 pg/ml. These results strengthen the idea of specific inhibition of the TLR2 complex. 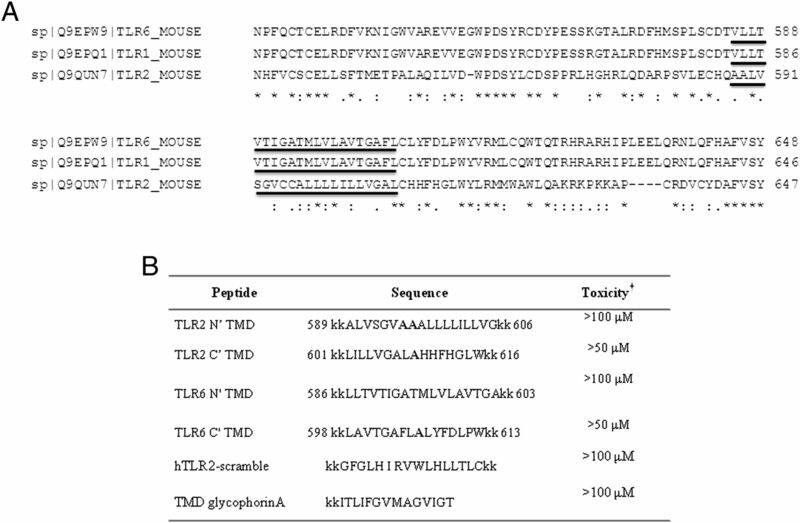 Two additional control peptides, an hTLR2 TMD-scrambled peptide (scr) and an unrelated GpA TMD peptide failed to inhibit TNFα secretion upon LTA or Pam3CSK4 stimulation (Fig. 2C, 2D, right bars). In addition to TNF-α release, IL-6 secretion was also determined as this cytokine represents an additional marker for TLR activation (31). TLR2/6 TMD peptides inhibited IL-6 secretion after LTA and Pam3CSK4 stimulation, with inhibition varying from 60 to 80% (LTA activation) and 45 to 60% (Pam3CSK4 activation) (Fig. 2F, 2G, respectively). The maximal IL-6 secretion measured was 122.3 ± 26.7 pg/ml (LTA) and 315.03 ± 25.2 pg/ml (Pam3CSK4). Both control peptides (scrambled and GpA) did not show a significant inhibition. To exclude the possible toxic effects of the peptides, we performed a 2,3-bis-2H-tetrazolium-5-carboxanilide inner salt assay. This assay determines the viability of the cells under the experimental conditions tested. TLR TMD peptides were shown to be nontoxic to macrophages at the concentrations examined (Fig. 1B). The total protein amounts of the lysed cells were also evaluated at the end of the experiment. Similar amounts of proteins were detected from treated and untreated cells, suggesting that no differences in cell viability existed at the end of the experiments (Supplemental Fig. 1). The addition of the peptides alone did not alter the basal level of TNF-α secretion. Taken together, these findings suggest that the effect of the TLR2 and TLR6/1 TMD peptides is specific for TLR2. TMDs are classically expected to obtain an α-helical structure within the membrane. In this study, we measured the secondary structure of the TLR TMD–derived peptides in solution (PBS) and in a solution with membrane mimetic environment (1% LPC), and the spectra are shown in Fig. 3. The data revealed that all the peptides are practically unstructured in PBS but adopt significant α-helical structures in LPC (TLR6N′ TMD = 45%; TLR6C′ TMD = 40%; TLR2N′ TMD = 60%; TLR2C′ TMD = 89%). Secondary structure of the TMD peptides determined by CD spectroscopy in PBS solution and in a membrane mimicking solution. The secondary structure of each peptide was determined using CD spectroscopy. (A) TLR6 N′; (B) TLR6 C′; (C) TLR2 N′; (D) TLR2 C′). HPLC purified peptides (50 μM) were dissolved in PBS (light gray dashed line) or in PBS with 1% (w/v) LPC (solid black line). Spectra were measured from 195 to 260 nm. For all measurements the spectrum of each solution alone was subtracted. The results presented are an average of three repeats. FRET analysis was used to explore the interactions between the TMD peptides within LUVs (PC:Chol 9:1). This lipid composition is routinely used to mimic the outer leaflet of the plasma membrane of mammalian cells. TLR6 TMD peptides (both N′ and C′) labeled with fluorescein were used as donors, and their counterparts, TLR2 TMD peptides labeled with rhodamine, were used as acceptors. The decrease in the emission of fluorescein-conjugated peptides, after the addition of successive amounts of rhodamine-labeled peptides, served as an indication of the interaction between a pair of peptides. The data revealed that TLR6 TMD peptides are capable of forming homodimers as well as heterodimers with TLR2 TMD peptides (Fig. 4). TLR6C′ TMD and TLR6N′ TMD peptides showed a higher propensity toward forming heterodimers than homodimers. TLR6C′ TMD homodimers and TLR6/2C′ TMD heterodimers gave maximum FRET of 16.09 ± 1.88 and 20.59 ± 1.67%, respectively (Supplemental Fig. 2A). TLR6N′-TMD homodimers and TLR6/2N′-TMD heterodimers gave 14.16 ± 2.31 and 25.3 ± 2.03%, respectively (Supplemental Fig. 2B). We have also measured the affinity (KFaff) for the specific homodimers and heterodimers based on our FRET results. In both cases, the KFaff values for TLR6 TMD homodimers were lower than those calculated for the TLR2/6 TMD heterodimers (5.99 ± 1.80 and 2.31 ± 10 M−1, for C′ heterodimers and homodimers, respectively, and 2.31 ± 0.20 and 0.52 ± 0.25 M−1 for N′ heterodimers and homodimers, respectively). For both cases, the differences between the homodimers and heterodimers was statistically significant (p < 0.01) (Fig. 4G, 4H). A rhodamine-conjugated peptide composed of the TMD of the TCR-α (32) was used as a negative control and showed no significant decrease in the fluorescence signal (Fig. 4A, 4D). The ability of the different TMDs to interact with each other and to prefer heterodimerization rather than homodimerization is consistent with the fact that the corresponding TLR proteins require a shift toward heterodimerization for their activation (10, 33). The FRET results indicate that the TMDs of these proteins might be involved in this transition. FRET between TLR6 TMD peptides and other TMD peptides. TLR6 TMD peptides were labeled with fluorescein (donors) and loaded on PC:Chol LUVs. Changes in the emission signal intensity (between 500 and 600 nm) were monitored repeatedly after adding successive amounts of a specific rhodamine-labeled peptide (acceptor). (A–C) Fluorescein-labeled TLR6C′ TMD was tested with rhodamine-labeled TLR6C′ TMD (homodimers, B), TLR2C′ TMD (heterodimers, C), and TCR-α TMD domain peptide (Rho-GLRILLLKV-NH2) as a negative control (A). (D–F) Fluorescein-labeled TLR6N′ TMD was tested with rhodamine-labeled TLR6N′ TMD (homodimers, E), TLR2N′ TMD (heterodimers, F), and TCR-α TMD peptide as a negative control (D). Acceptor peptides were used at concentrations 0.025, 0.05, 0.1, 0.2, and 0.4 μM. Upper curve shows no acceptor, lowest curve shows the highest acceptor concentration. Donor peptide concentrations used were 0.1 μM. (G and H) Fitted curves of the dependence of the percentage of FRET on the acceptor:donor ratio. Curves for heteroassociation (with the reciprocal TLR2 TMD peptide, full line) and homoassociation (dashed line) of the TLR6 C′ (G) and TLR6 N′ TMDs (H) are shown. A lower ratio in which 50% FRET was reached indicates stronger affinity between the peptides. Curves were calculated based on the average of three different experiments. To verify that the TMD acceptor peptides are fully bound to the liposomes during the FRET experiments, we performed lipid binding assays with PC:Chol liposomes and NBD-labeled peptides. 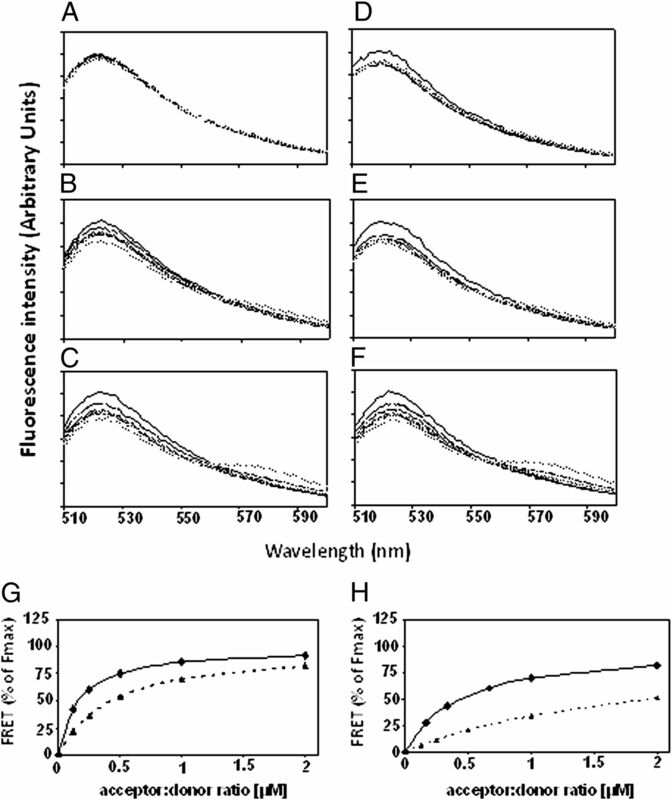 NBD fluorescence changes upon insertion into a hydrophobic environment, enabling one to determine the affinity of the peptide toward the PC:Chol liposomes. The data revealed that TLR6C′ TMD and TLR6N′ TMD have a relatively strong affinity toward liposomes, with Ka values of 7.8 × 104 and 1.5 × 104 [M−1], respectively (titration curves not shown). Such high affinities suggest that during the FRET experiments the TMD acceptor peptides are fully bound to the liposomes. The GALLEX system (24) was used to evaluate the ability of TLRs 2 and 6 TMDs to heteroassociate in biological relevant membranes. β-gal activity was measured after the expression of LexA-TMD-MBP chimera proteins where the TMDs are those of TLRs 2 and 6, either the N′ or C′ termini for each TMD. Briefly, only constructs containing two interacting TMDs will drive the association of the LexA and the repression of β-gal (for a more detailed explanation on this system, see Materials and Methods). All TLR TMD sequences tested showed high dimmerization activity (Fig 5A). Two additional controls were added; the GpA TMD was expressed as a positive control. This sequence is highly studied and well defined for many of the driving forces of its association within membranes, as well as characterized for the significance of the GxxxG motif within it. A heterodimerization-deficient mutant sequence of GpA, G83I, served as a negative control, as abrogating the GxxxG motif was shown to substantially decrease the association levels (Fig. 5A). Western blot analysis for the expression levels of MBP was performed to normalize the expression level of the β-gal to the expression levels of the chimera protein. Because this protein is part of both chimeras, it cannot be used to distinguish between their individual expression levels but serves as the reference point for the total amount of protein expressed in each group (Fig. 5B). Finally, a MalE complementation assay was used to test for LexA-TMD-MBP orientation. For that purpose, E. coli PD28 cells that do not contain a functional MBP were transformed with various constructs and cultivated on M9 agar plates containing 0.4% maltose as the sole carbon source and 0.02% IPTG. This control clearly shows that the chimera proteins expressed are oriented properly in the membrane, because only cells expressing the chimera protein in the correct orientation will grow under these conditions (Fig. 5C). The TMDs of TLR2 and 6 heterodimerize in E. coli membranes. (A) β-gal activity was measured after the expression of LexA-TMD-MBP chimera proteins in E. coli cells. The TMDs inserted were either the N′ or C′ termini of TLR2 or TLR6 TMDs. GpA TMD was used as a positive control and its heterodimerization-deficient mutant as a negative control sequence. The data are the summary of three independent experiments (B). The expression levels of the chimera proteins were evaluated by blotting the MBP to normalize β-gal activity to the chimera protein expression levels (n = 3). (C) MalE complementation assay (scanning of agar plate). E. coli PD28 cells lacking a functional MBP were transformed with the various constructs and cultivated on M9 agar plates containing 0.4% maltose as a sole carbon source and 0.02% IPTG. Nontransformed bacteria (PD28) served as a negative control. Co-IP experiments were performed to detect interactions between the native TLR proteins and the TLR TMD peptides as well as the control peptides. For this purpose, cell lysates incubated with either rhodamine-labeled TLR TMD peptides or control peptides were incubated with specific TLR Abs bound to protein G beads. Stable peptide–protein complexes formed were then subjected to SDS-PAGE. The presence of the fluorescent peptide was measured by a fluorescent scanner. At 5 μM, TLR6N′ TMD peptide precipitated more with TLR2 Abs compared with TLR6 Abs (Fig. 6A, upper panel). Furthermore, TLR2 N′ TMD peptide interacted better with TLR6 Abs compared with TLR2 Abs (Fig. 6A, lower panel). Similar results were seen for the co-IP of TLR2C′ TMD peptide with TLR1, TLR2, and TLR6 Abs, because of the fact that TLR1 and TLR6 proteins contain an identical TMD (Fig. 6B). In comparison, the TLR2 C′ scrambled peptide (scr) showed a low signal, and GpA TMD peptide binding was undetectable under these conditions. These results indicate low TLR-peptide nonspecific interaction (Fig. 6B). These low degrees of association further strengthen the idea of specific binding between the TLR TMD peptides to their corresponding TLRs. An Ab against GFP (anti-GFP) was used as an Fc control and similarly to GpA TMD showed no protein–peptide binding. To ensure proper loading of the samples, Western blot analysis with anti-tubulin was used on the total cell lysates. This control clearly shows that protein levels loaded onto the beads were comparable for all the different samples (Fig. 6B, lower lane). To validate that the TLR TMD peptides association with their reciprocal TLR protein is not driven by nonspecific hydrophobic forces within the membrane or from the procedure itself, we performed IP toward TLR4 (Fig. 6C). This negative control, as well as the finding that GpA TMD does not precipitate with TLR2/4, clearly emphasizes the specific association of the TLR6C′ TMD peptide with the TLR2 protein. Successful precipitation was verified by Western blot against the specific TLRs tested (Fig. 6C). Collectively, these results reinforce our FRET results and provide a sound foundation for a model where TLR TMD peptides preferentially associate with their reciprocal TLR proteins (i.e., TLR6 and TLR2 TMD peptides with TLR2 and TLR6 proteins, respectively). TLR2 and TLR6/1 TMD peptides are able to physically interact with TLR6/1 and TLR2, respectively. (A) Macrophage cells were incubated with 5 μM rhodamine-labeled peptides (TLR6N′ TMD and TLR2N′ TMD, respectively) or with DMSO alone (−). After 2 h of incubation, cells were washed and lysed using radioimmunoprecipitation assay buffer; soluble fraction was used for immunoprecipitation with the indicated TLR Abs. Protein samples were run on SDS-PAGE, and the presence of the labeled peptide was detected with a fluorescent scanner (excitation, 532 nm; emission, 585 nm). (B) Experiments were performed as described in (A), with 10 μM peptide. The peptides used were TLR2C′ TMD (TLR2 C′), GpA TMD (GpA) and the TLR2 scrambled peptide (scr) peptide. A sample of cell lysate without pre-exposure to a synthetic peptide is shown as well (no pep). GFP Ab served as an Fc control. (C) The specific association of the TLR6C′ TMD peptide was evaluated by IP against TLR2 and TLR4. As a negative control we used the GpA TMD peptide (GpA). Successful IP was detected by blotting TLR4 and TLR2 in the appropriate samples. 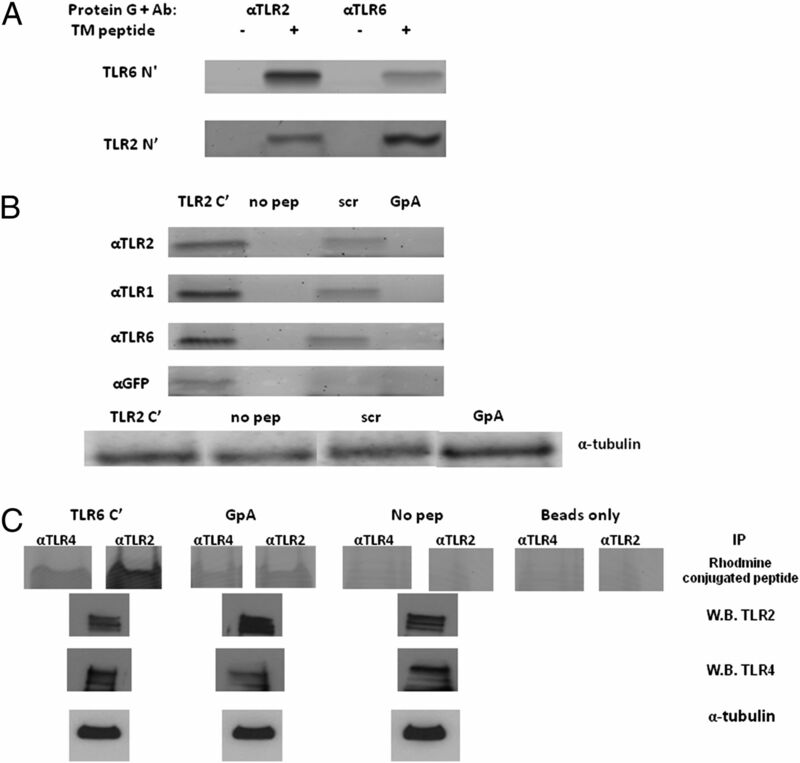 Equal loading was measured by detection of anti-tubulin in the cell lysate. All experiments were performed at least three times, and the data presented reflect representative experiments. The rhodamine fluorescence assay was used to examine the ability of the peptides to self-assemble in solution and within a membrane. The initial emission of rhodamine-labeled peptides was measured at 580 nm in a solution only and in a solution containing PC:Chol LUVs. Proteinase K was then added and the increase in the emission over time was recorded. Elevation in emission is caused by the breakdown of the oligomeric state of the peptides and the release of the rhodamine molecule from quenching induced by its association with other rhodamine molecules within the oligomer. Thus, initial higher fluorescence indicates less assembled peptides. A high and fast increase in the fluorescence over time indicates that the fluorophore-conjugated peptide was in an oligomeric quenched state prior to the addition of the proteinase K. The known oligomeric antimicrobial peptide LL37 was used as a positive control because of its high oligomeric state and the well described kinetics of proteinase K proteolysis (34). When present in a solution containing LUVs, TLR6 TMD peptides yielded a slow increase in fluorescence over time, suggesting that to some extent these peptides do form homo-oligomers in membranes (Fig. 7A). In contrast, TLR2 TMD peptides did not show changes before and after the protease treatment, suggesting that these peptides are monomeric within the lipid bilayer (Fig. 7B). These results are in agreement with the FRET results, suggesting that TLR6 TMD peptides can self-assemble to some extent to form homodimers. TLR TMD peptides differ in their ability to self-assemble in a membrane mimetic. Rhodamine-conjugated TLR TMD peptides were added to a solution with PC:Chol LUVs (0.1 mM), and their emission at 580 nm was recorded before and after the addition of proteinase K. The addition of the proteinase K is indicated by a black arrow. (A) TLR6C′ TMD (black line) and TLR6N′ TMD (gray line) are capable of self-assembly in PC:Chol LUVs, to some extent. (B) TLR2C′ TMD (black line) and TLR2N′ TMD (gray line) emission does not change before and after the addition of proteinase K to the system, suggesting a monomeric state. (C) LL37 is shown as an example of a peptide that is highly oligomerized in LUVs. All experiments were performed at least three times, and the data presented reflect representative experiments. When examined in buffer without LUV’s, all peptides self-assembled to some extent with TLR2 TMD N′, forming strong oligomers. Interestingly, these strong oligomers were dissociated upon the addition of LUVs, strengthening the idea that in the hydrophobic membrane, this peptide favors a monomeric state (results not shown). As expected, the positive control rhodamine-LL37 displayed very high and rapid recovery of fluorescence in a lipid environment (Fig. 7C), characteristic of highly oligomeric peptides (34). To test the activity of the peptides in vivo, we used a murine model for acute sepsis caused by hyperactivation of TLR2. Mice were injected i.p. with 100 μg LTA and treated with TLR2C′ TMD peptide in different regimes (for details, see Materials and Methods) or with saline only. All mice administrated with saline only died within 24 h after LTA injection (Fig. 8A). In contrast, mice treated with 5 mg/kg peptide had survival rates of 62.5%, up to 14 d after LTA injection. In addition, the ability of the peptide to serve as a prophylactic agent and prevent sepsis-like effects in mice was tested by injecting 10 mg/kg peptide 1 h before the LTA challenge. Using this protective protocol revealed both a significant attenuation at the time of death as well as a complete recovery of 25% for the mice surviving the LTA challenge. The TLR2C′ TMD peptide protective effect was also tested in a TLR4-driven septic shock model. In this experimental model, purified LPS (2 μg) and TLR2C′ TMD (5 mg/kg) were administered i.p. as described for the TLR2 model. Remarkably, all mice, both treated and untreated, died within 24 h after the LPS challenge (Fig. 8B). This suggests that this peptide specifically inhibits TLR2 but not TLR4 when administered in vivo. During the course of the experiments, mice treated with the peptide exhibited no noticeable adverse effects. TLR2C′ TMD peptide is able to inhibit specifically TLR2 activation in vivo. (A) Mice were treated with a single i.p. injection of LTA, then injected with TLR2C′ TMD peptide at the indicated concentrations or left untreated (saline only, gray triangle). A second injection was given 12 h later (5 mg/kg, gray rectangle). For the protective protocol, a single injection of 10 mg/kg of peptide was given 1 h prior to LTA injection (gray diamond). Survival was monitored for the next 14 d. (B) The LPS experiment was performed as described above with mice left untreated (LPS only, gray rectangle) or peptide treated (LPS and TLR2C′ TMD, gray diamond). All mice died within 24 h; n = 8 for all groups. (C and D) Mice were administrated with a single i.p. injection of LTA or saline (nontreated) and immediately were injected with TLR2C′ TMD (5 mg/kg) (LTA+ TLR2C′ TMD) or left untreated (LTA only). n = 4/group. Serum was collected from all mice, and ELISAs were performed to detect sera levels of TNF-α and IL-6 [(C) and (D), respectively]. For TNF-α, *p = 0.02. For IL-6, **p = 0.006. Statistical analysis was done by using the standard Student t test. (E) TLR2C′ TMD reduces TNF-α–induced tissue damage to the liver. Mice were treated as described in the in vivo cytokine assay, and liver tissues were collected 24 h after the injection. Liver sections (4 μm) were stained for H&E after fixation using formaldehyde. From left to right, Control mice injected with saline, mice injected with LTA and D-gal, and mice treated with TLR2C′ TMD peptide simultaneously with the injection of LTA (original magnification ×20). To verify that the survival rates observed for the peptide treated animals are the result of a decrease in the LTA-induced inflammation, we determined the levels of TNF-α and IL-6 secreted to the bloodstream in these animals. Both cytokines are hallmark features of acute inflammation, and TNF-α is considered as the key cause of sepsis. In accordance with the survival rates, our results indicate that the levels of TNF-α and IL-6 (Fig. 8C, 8D, respectively) in the bloodstream were significantly lower for the peptide-treated group compared with the untreated group. 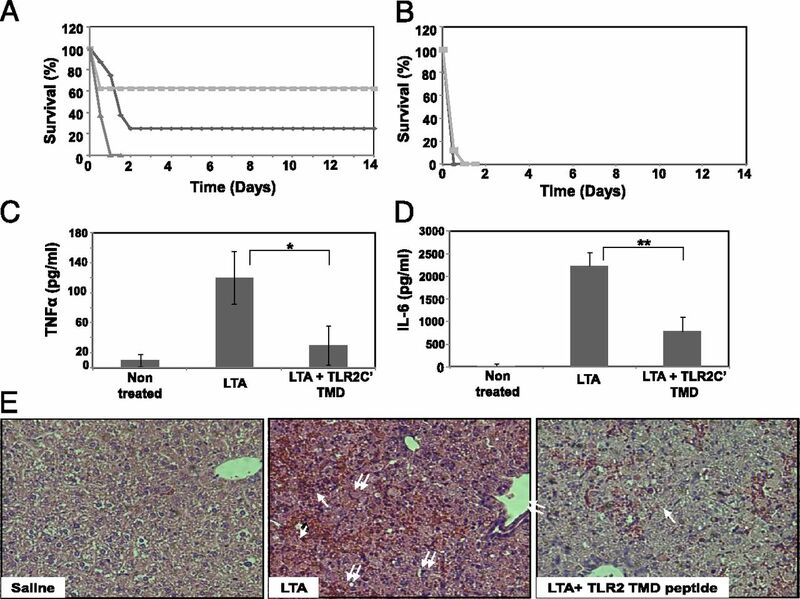 To further evaluate the levels of TNFα secretion induced by the injection of LTA in vivo to peptide treated versus untreated animals, we obtained liver tissues from the three mice groups 24 h after LTA challenge. Under the experimental conditions used, the addition of D-gal causes transcription inhibition in the liver. Accordingly, when TNF-α enters the liver from the bloodstream, it is able to activate only the death pathway and not its survival pathway, which is based on NF-κB transcription. As shown elsewhere (35), there is a direct correlation between the levels of TNF-α in the bloodstream and tissue damage, cell rupture, hemorrhage, and blood cell infiltration to the liver. The data shown in Fig. 8E reveal that injecting LTA + D-gal induced severe liver inflammation. Following LTA treatment, the degree of cell rupture, evident by the presence of blood cells (white single arrows), as well as many nonparenchymal cells (double white arrows) is significantly higher than in untreated normal tissue (saline only). Furthermore, the entry of blood cells into the liver is not located at a specific region near the main blood veins but is spread throughout the tissue. This is a phenotype typical for TNF-α–mediated fulminant hepatic failure. In contrast, the degree of cell rupture was significantly reduced upon the injection of 5 mg/kg TLR2C′ TMD peptide simultaneously with the LTA+ D-gal. Nonparenchymal cells were present yet at a significantly lower frequency. To further study the ability of the TLR2C′ TMD peptide to inhibit sepsis-like effects we generated an additional model using whole-heat killed bacteria. To induce activation via the heterodimerization of TLR2 and TLR6, we used Gram-positive bacteria S. aureus. Bacteria were grown to OD = 1 and resuspended in sterile saline, heat killed at 90°C and injected i.p. to mice (n = 5). Mice were immediately treated with either TLR2C′ TMD or a scrambled peptide (scr) or injected with an additional amount of saline as a control. As can be seen in Fig. 9A, after 48 h 40% of the mice survived in the TLR2C′ TMD group, whereas in the scr-treated group, all mice died after less than 24 h. In addition, ELISA for serum IL-6 and TNF-α were performed as described previously. As seen in Fig. 9B and 9C, respectively, the TLR2C′ TMD peptide inhibited the levels of cytokines in the serum, whereas the scr peptide had little (IL-6) or no effect (TNF-α). Because no positive outcome was observed when conducting the synthetic inflammation mouse model using LPS as the inducer of sepsis-like conditions, we did not conduct a whole bacteria assay using Gram-negative bacteria. The TLR2C′ TMD peptide protects from S. aureus–induced sepsis through reduction of the cytokine levels secreted into the bloodstream. (A) Mice were injected i.p. with 1 × 1011 heat-killed bacteria (in sterile saline, 200 μl) and immediately with a second injection of 5 mg/kg TLR2C′ TMD peptide (▪) or 5 mg/kg TLR2 scrambled peptide (▴) or saline (♦) at the same volume (200 μl). Mice monitoring was maintained for 48 h. The scr-treated group showed full lethality after less than 24 h; in the nontreated group, full lethality was reached after 32 h; the TLR2C′-treated group showed 40% survival at the end of this assay (n = 5). (B and C) Blood samples (150–200 μl) were collected from the mice 90 min after administration of the heat-killed bacteria. Blood was left to coagulate and serum was used for ELISAs to determine secretion levels of IL-6 (B) and TNF-α (C). As a baseline reference of the cytokine levels in serum, blood sample from a naive nontreated mouse was used. Statistical analysis was done using Student t test, *p < 0.05 (n = 5). Because the discovery of their function as mammalian pattern recognition receptors, TLRs were shown in numerous studies to be essential for the initiation and progression of the innate immune response (36–39). These receptors were also shown to be of major importance in many other physiological processes such as lipid metabolism and diabetes, cancer progression, and neurogenesis (40–42). New modes of action, concepts of regulation, and functional ligands are still being discovered and characterized (43–45). As a consequence of their essential role in so many different processes, their mode of action and regulation were extensively studied, concentrating on both the cytoplasmic tails as well as the extracellular stalks. A seminal study by Jin et al. (9) described the crystal structure of the hetero association of TLR2/1. In their study, they describe the low sustained association of both hetero- and homoassociations of these pairs. Furthermore, they indicate that ligand binding leads to structural changes favoring additional “association points,” resulting in a sustainable interaction allowing for activation of the downstream cascade (9). One of the major limitations of current crystal structure methods is the inability to crystallize TM segments in their natural environment. Therefore, to date, it is not possible to evaluate the contribution of these regions for the shift between nonactivated short-term associations and durable interactions leading to TLR activation. Hence, interfering with the formation of such interaction indicates their significance for regulation and activation. This study provides direct evidence that TLR6 and TLR2 TMDs are involved in the activation and regulation of these receptors. Exogenous peptides corresponding to the N′ terminus or the extended C′ terminus of these regions were able to inhibit TLR2 but not TLR4 activation, both in vitro and in vivo. Several experimental approaches were used to determine the peptides’ properties that could shed light on their mode of action. Using biophysical approaches (FRET and self-assembly assays) we observed interactions between the peptides, revealing that they prefer hetero- rather than homodimerization. Interactions within the membrane of E. coli, measured by the GALLEX system, further revealed heterodimerization between TLR2/6 TMD sequences. In addition, we show by CD spectroscopy that the TMD-derived peptides increase significantly their α-helix content when assayed in the presence of a membrane mimicking solution, exhibiting classical properties of TMD elements. Finally, biochemical coimmunoprecipitation assays showed that peptides based on the TMDs of the examined TLRs can physically interact with the native proteins, preferably as heterodimers. In comparison, the Scr peptide showed very similar low background binding to all TLRs tested. This is probably the result of nonspecific hydrophobic interactions. In addition, a second unrelated control TMD peptide (GpA) did not show any binding to the tested TLR. In addition to the in vitro results, TLR2 TMD C′ peptide could inhibit TLR2 activation in vivo as well. Using a murine model for acute septic shock caused by LTA, administration of this peptide rescued 62.5% of the mice in comparison with no survival of untreated mice, as well as 25% rescue in a protective, prophylactic model. Cytokine profiles of key cytokines in sepsis development and histology sections suggest an overall reduction in the severity of the disease in the peptide-treated animals. In contrast to these results, this peptide did not affect mouse mortality in a LPS-based model, strengthening the idea that this peptide is directly involved in inhibiting TLR2 activation in these animals. The finding that survival rates were stable from 48 h onward after LTA injection suggests that the surviving animals were completely and irreversibly cured with no noticeable adverse effects. Earlier studies by Hashimoto et al. (46, 47) suggested that the contaminating lipoproteins, which exist in LTA preparations from wild-type bacteria, are responsible for macrophage activation induced by LTA. Nevertheless, Morath et al. (48) and Deininger et al. (49) showed that synthetic LTA was as active as native LTA from S. aureus. In addition, these researchers developed an improved butanol extraction that yielded LTA with over 99% purity that was fully active, suggesting that the acute inflammatory properties of LTA are attributed to the pure molecule. To further validate the therapeutic potential of the TLR2C′ TMD peptide we tested its ability to rescue mice from a lethal exposure to heat-killed S. aureus. Mice treated after bacterial injection with the TLR2C′ TMD peptide showed 40% survival and 20–25% reduction in TNF-α and IL-6 levels in the serum. In contrast, mice treated with the scrambled peptide showed no beneficiary effect in survival or in cytokine levels in sera. Taken together, the data suggest that binding of the peptides to their corresponding TLR TMDs (i.e., TLR2 TMD peptides for TLR6 protein and TLR6 TMD peptides for TLR2 protein) regulates the activity of these receptors. The current model for activating TLR2/6 and TLR2/1 complexes suggests that upon ligand binding there is a shift between weakly bound heterodimers toward high-affinity heterodimers (9, 11). The fact that the TMD peptides prefer to bind in a heterodimeric rather than a homodimeric fashion suggests that by binding to their reciprocal receptor, these peptides are able to maintain the TLR proteins in a monomeric inactive form. Thus, the present work provides initial evidence for the role of these TMDs in the assembly and activation of these receptors. Several other lines of evidence contribute to this idea. A study by Hawn et al. (37) showed that a single nucleotide polymorphism in the TMD of human-TLR1 (I602S) correlates with altered immune response to triacylated lipopeptides. This suggests that the reported region is involved in the regulation or activation of the TLR1/2 complex (37). In addition, this SNP was also shown to be associated with Crohn’s disease, a pathology that leads to constant chronic inflammation of the ileum (50). Recent studies have shown that this SNP is involved in differential trafficking of this receptor thus impacting immunity to mycobacteria (51). Several reports showing that the hydrophobic domains surrounding the TMDs of TLR4, TLR3 and TLR9 can affect the dimerization (TLR4) or localization (TLR3 and TLR9) of these proteins (16–18). The corresponding hydrophobic regions in TLR2/6 are included in the TLR C′ TMD peptides, strengthening the idea that these regions are important for TLR function. Taken together, these studies strongly support our results and initial hypothesis, suggesting that the TMDs of TLR6 and TLR2 are involved in the activation and/or regulation of the proteins. Proper assembly and function of membrane proteins has been shown in many cases to involve TM–TM interactions (52). Studying these interactions is a challenging task due to fact that these are transient interactions that are taking place in the highly complex environment of the biological membrane (53). In the field of TLR biology, although much is known about ligand binding and interactions within the extracellular domains, little is known about how this transition is relayed across the membrane to the intracellular domain to initiate signaling. In this work, we add further evidence to support the existing data that TLR TMDs are involved in TLR dimerization and might be involved in their regulation. The fact that the peptides inhibit TLR2 activation both in vitro and in vivo (see below) suggest that the TLR TMDs are involved in the transition between the nonactive to active state. A better understanding of the role of the TMDs in TLR function would shed more light on the molecular switches of these important molecules. Finally, modulating the activity of TLR proteins in vivo is of great importance. This strategy is currently being tested on various pathologies that involve deregulated TLR activity such as cancer, inflammatory bowel disease, and asthma (54). There is much interest in chronic and acute inflammation states that can be regulated by modulating the activity of a specific TLR protein. One such example is sepsis, which has been a major health concern in hospitalized patients (55). To date, there is still no general treatment for this condition, and the available options have potentially lethal side effects or are still experimental in nature (55, 56). A recent study (57) has shown that TLR2 downregulation had a positive effect on polymicrobial sepsis, suggesting that this specific receptor plays a crucial role in developing this pathology. This study demonstrates that it is possible to rescue mice afflicted with lethal sepsis-like syndrome by specifically inhibiting TLR2. Moreover, the peptide reported also had a prophylactic effect, which might have a high therapeutic value. These TLR-derived peptides can be used as a mechanistic tool to probe TLR structure and function and should be further studied for their potential role in a variety of pathologies where TLR2 inhibition is needed. We thank Dr. Dirk Schneider from the University of Gutenberg in Mainz, Germany, for providing all the necessary materials and guidance for the GALLEX system. We deeply thank Dr. Beata Toth-Cohen and Muhammad Ali for advice and assistance in preparation and analysis of the in vivo studies. We also thank Dr. Yosef Rosenfeld, Avi Ashkenazi, and Ron Sahar-Dover for helpful comments and fruitful discussions. This work was partially supported by the Josef Cohn Minerva Center for Biomembrane Research and the German Israeli Foundation (to Y.S.).
. 2007. Critical role of toll-like receptors and nucleotide oligomerisation domain in the regulation of health and disease. J. Endocrinol. 193: 323–330.
. 2003. Molecular characterization of the acute inflammatory response to infections with Gram-negative versus gram-positive bacteria. Infect. Immun. 71: 5803–5813.
. 2009. 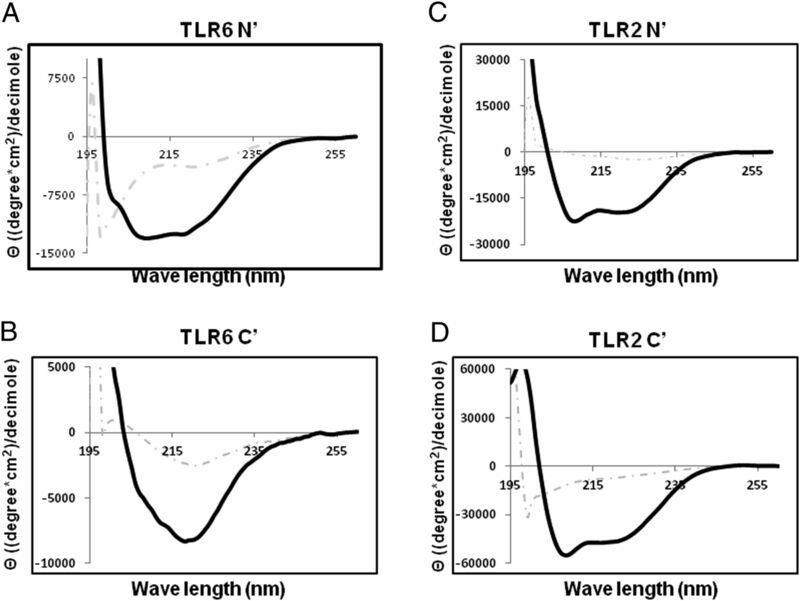 Recognition of lipopeptide patterns by Toll-like receptor 2-Toll-like receptor 6 heterodimer. Immunity 31: 873–884.
. 2002. The single transmembrane domains of ErbB receptors self-associate in cell membranes. J. Biol. Chem. 277: 4704–4712.
. 2007. Specificity in transmembrane helix-helix interactions mediated by aromatic residues. J. Biol. Chem. 282: 19753–19761.
. 2010. Pore opening and closing of a pentameric ligand-gated ion channel. Proc. Natl. Acad. Sci. USA 107: 19814–19819.
. 2012. Isolated Toll-like receptor transmembrane domains are capable of oligomerization. PLoS One 7: e48875.
. 2006. The transmembrane domain directs TLR9 to intracellular compartments that contain TLR3. Biochem. Biophys. Res. Commun. 343: 578–584.
. 2011. Transmembrane mutations in Toll-like receptor 9 bypass the requirement for ectodomain proteolysis and induce fatal inflammation. Immunity 35: 721–732.
. 2006. Ligand-independent oligomerization of TLR4 regulated by a short hydrophobic region adjacent to the transmembrane domain. Biochem. Biophys. Res. Commun. 341: 1128–1134.
. 2004. Suppression of human prostate tumor growth in mice by a cytolytic D-, L-amino Acid Peptide: membrane lysis, increased necrosis, and inhibition of prostate-specific antigen secretion. Cancer Res. 64: 5779–5786.
. 2006. Inhibition of tumor growth and elimination of multiple metastases in human prostate and breast xenografts by systemic inoculation of a host defense-like lytic peptide. Cancer Res. 66: 5371–5378.
. 2008. Characterization of the interacting domain of the HIV-1 fusion peptide with the transmembrane domain of the T-cell receptor. Biochemistry 47: 4826–4833.
. 2006. Characterization of the HIV N-terminal fusion peptide-containing region in context of key gp41 fusion conformations. J. Biol. Chem. 281: 21755–21762.
. 1991. Interaction of fluorescently labeled pardaxin and its analogues with lipid bilayers. J. Biol. Chem. 266: 23769–23775.
. 2003. GALLEX, a measurement of heterologous association of transmembrane helices in a biological membrane. J. Biol. Chem. 278: 3105–3111.
. 1998. A new LexA-based genetic system for monitoring and analyzing protein heterodimerization in Escherichia coli. Mol. Gen. Genet. 257: 205–212.
. 2002. The consequence of sequence alteration of an amphipathic alpha-helical antimicrobial peptide and its diastereomers. J. Biol. Chem. 277: 33913–33921.
. 1998. Cys-scanning mutagenesis: a novel approach to structure function relationships in polytopic membrane proteins. FASEB J. 12: 1281–1299.
. 1996. Cysteine-scanning mutagenesis of transmembrane domain XII and the flanking periplasmic loop in the lactose permease of EScherichia coli. Biochemistry 35: 12909–12914.
. 1993. Cysteine scanning mutagenesis of putative transmembrane helices IX and X in the lactose permease of Escherichia coli. Protein Sci. 2: 1024–1033.
. 2007. TLR signaling. Semin. Immunol. 19: 24–32.
. 2007. T-cell inactivation and immunosuppressive activity induced by HIV gp41 via novel interacting motif. FASEB J. 21: 393–401.
. 2006. Endotoxin (lipopolysaccharide) neutralization by innate immunity host-defense peptides: peptide properties and plausible modes of action. J. Biol. Chem. 281: 1636–1643.
. 2008. Acute liver failure: mechanisms of hepatocyte injury and regeneration. Semin. Liver Dis. 28: 167–174.
. 2001. Recognition of double-stranded RNA and activation of NF-kappaB by Toll-like receptor 3. Nature 413: 732–738.
. 2007. A common human TLR1 polymorphism regulates the innate immune response to lipopeptides. Eur. J. Immunol. 37: 2280–2289. 1997. A human homologue of the Drosophila Toll protein signals activation of adaptive immunity. Nature 388: 394–397.
. 2007. Listeria monocytogenes promotes tumor growth via tumor cell Toll-like receptor 2 signaling. Cancer Res. 67: 4346–4352.
. 2007. Toll-like receptors modulate adult hippocampal neurogenesis. Nat. Cell Biol. 9: 1081–1088.
. 2011. A subclass of acylated anti-inflammatory mediators usurp Toll-like receptor 2 to inhibit neutrophil recruitment through peroxisome proliferator-activated receptor γ. Proc. Natl. Acad. Sci. USA 108: 16357–16362.
. 2010. Oxidative stress induces angiogenesis by activating TLR2 with novel endogenous ligands. Nature 467: 972–976.
. 2006. Not lipoteichoic acid but lipoproteins appear to be the dominant immunobiologically active compounds in Staphylococcus aureus. J. Immunol. 177: 3162–3169.
. 2007. Evidence of immunostimulating lipoprotein existing in the natural lipoteichoic acid fraction. Infect. Immun. 75: 1926–1932.
. 2002. Synthetic lipoteichoic acid from Staphylococcus aureus is a potent stimulus of cytokine release. J. Exp. Med. 195: 1635–1640.
. 2007. Use of synthetic derivatives to determine the minimal active structure of cytokine-inducing lipoteichoic acid. Clin. Vaccine Immunol. 14: 1629–1633.
. 2012. Differential trafficking of TLR1 I602S underlies host protection against pathogenic mycobacteria. J. Immunol. 189: 5347–5355.
. 2012. Transmembrane domains interactions within the membrane milieu: principles, advances and challenges. Biochim. Biophys. Acta 1818: 974–983.
. 2006. Dynamic helix interactions in transmembrane signaling. Cell 127: 447–450. 2009. Sepsis and septic shock: inching forwards. Clin. Med. 9: 256–257. 2008. Activated protein C in sepsis: a critical review. Curr. Opin. Hematol. 15: 481–486.